Mid week dinner never looked so exciting, with this mouthwatering Gluten Free / Vegetarian combination of melt in your mouth flat mushrooms, spicy & creamy Coconut Lentil, tasty melted cheese and fresh chives! At Hart & Soul, we are all about balanced flavours & textures. The beautiful Melanie Lionello (@naturallynitritious) whom we developed our Coconut Lentil with has put this recipe together and it’s oh… so smart! You will have fun cooking, eating and feeling warm from your head to your toes with this one! This kind of comfort food, at it’s finest is great for you. Mushrooms are an amazing food. They are meaty, juicy and chewy. Their umami flavour (brothy/meaty) lends itself to an endless array of cuisines and dishes. Mushrooms are a source of iron and fibre and low in carbohydrates. They provide you with lean proteins and are free from cholesterol and fat. Due to their nutrient density, they actually rank higher than most fruits and vegetables, and some researches show that mushrooms are one of the rare foods that people can eat as often as possible, with no side effects. For this recipe, you can use either Portobello or regular Button mushrooms. It can easily be scaled up—doubled or tripled. You will need to scrub the mushrooms well first, then just snap out the stems. They’ll come out easily, no need to use a knife. 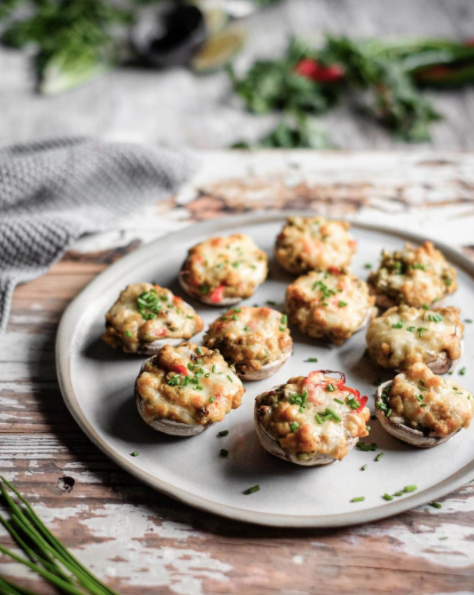 Have the mushrooms cleaned and stems removed ahead of time but don’t cook them until you want to serve: Once cooked, stuffed mushrooms do not hold up well for long periods. Bake some, serve and repeat. YUM!